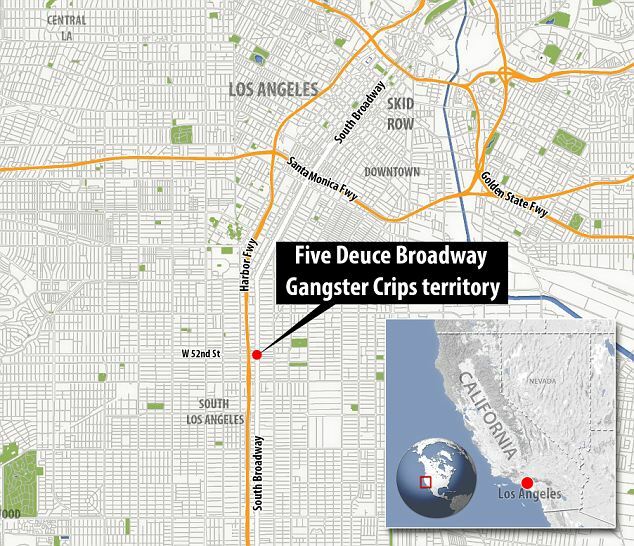 A member of the Five Deuce Broadway Gangster Crips (BGC) – who was found guilty by a jury last year of conspiring to engage in racketeering activities, which included him selling crack cocaine on Skid Row – has been sentenced to 360 months in federal prison. Tony "Wodi" Gordon, 36, of Freeport, Illinois, with three prior felony narcotics convictions, was sentenced yesterday by in Los Angeles by United States District Judge S. James Otero. Gordon was convicted late last year of conspiring to violate the federal Racketeer Influenced and Corrupt Organizations (RICO) Act. Members of conspiracy engaged in murders, robberies, witness and informant intimidation, and narcotics sales. The jury further convicted Gordon of agreeing to distribute approximately 10 ounces of crack cocaine, as well as marijuana. During yesterday’s sentencing hearing, Judge Otero noted that Gordon continued to come to court in a wheelchair despite no evidence of a disability and a jail video showing Gordon engaging in a fistfight with another inmate. Judge Otero concluded that Gordon committed perjury when he testified about his fabricated medical condition. Gordon’s sentencing follows a hearing last month when BGC’s leader – Tyrine Martinez, 36, of Vernon – was sentenced to nearly 22 years in federal prison. Other BGC members have recently received substantial prison sentences. Martinez was the lead defendant named in a 213-page RICO indictment that charged 72 members and associates of the BGC, a street gang that claims territory in South Los Angeles and controls drug sales in an area just west of Skid Row. The indictment outlined two decades of criminal conduct, including murders, robberies, extortion, illegal firearms possession, witness intimidation and narcotics trafficking. Fifty-seven of the defendants in the case have been convicted by guilty plea or at trial. The remaining 15 defendants are scheduled to go on trial in November. The investigation into BGC was conducted by agents and officers with the Federal Bureau of Investigation and the Los Angeles Police Department. Considerable assistance was provided during this investigation by the California Department of Corrections and Rehabilitation, the Torrance Police Department, the Buena Park Police Department, the El Segundo Police Department, the San Bernardino Police Department and the Los Angeles City Attorney’s Office.